Ecuador’s Tungurahua volcano has been erupting intermittently since 1999. On Wednesday, it picked up activity again and hundreds of local villagers were evacuated. One of Ecuador's most active volcanoes explosively erupted again Wednesday, causing hundreds of villagers living in the volcano's shadow to be evacuated. The volcano spewed molten rock, gas and ash in its latest eruption and experts suggest things could get worse before they get better, according to a Reuters story. Tungurahua has been erupting intermittently since 1999, with the latest round of activity heating up in January. In the latest eruption, ash plumes have routinely risen up to nine kilometers above the volcano's summit, according to the Smithsonian Global Volcanism Program. Residents reported hearing "roaring noises and cannon shots" nearly everyday over the past couple of weeks, with people as far as 13 kilometers away reporting their windows rattling from the explosions, Smithsonian reported. The local seismic network is recording between 65 and 208 explosions daily. 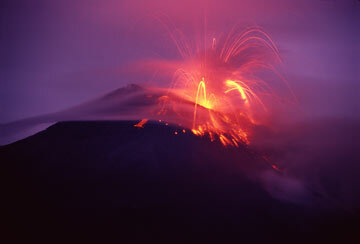 The volcano is also sending lava and glowing, hot rocks hundreds of meters down its slopes. During past eruptions, scientists and emergency officials have had trouble getting locals to evacuate and leave their homes and fields, which occasionally has led to unnecessary deaths (see Geotimes, November 2007). No injuries or deaths have been reported so far in the latest eruption.